With less than half of a season remaining in the Metrodome, progress on Target Field, the new home of the Minnesota Twins, is coming along nicely. 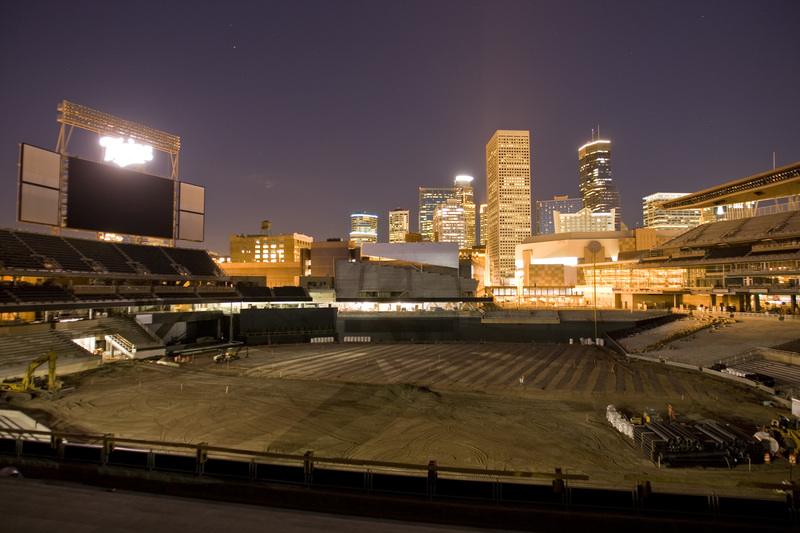 The bulk of the field's sod is installed and the view of the Minnespolis skyline at night is impressive. Hopefully tickets are easy to come by when my little girl gets old enough to sit through a full nine innings. Amazing this colossal waste of resources and taxpayer money goes up in shut a short amount of time. And yet the Wakota bridge project (something that actually serves a public good) drags on for decades. I actually agree. The idea of taxpayer funds building a private playground for millionaires is outdated. The practice needs to come to an end.